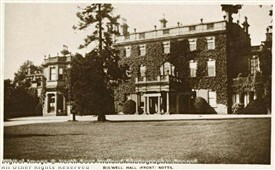 Bulwell Hall was built by John Newton in 1770. He died in November 1820, closely followed by his son. The estate then went to the Rev. Alfred Padley. In 1864, the Hall was sold by Alfred Padley’s son, the Rev. Charles J. A. Padley; it was purchased by Samuel Thomas Cooper. The Hall was next owned by Thomas Hardy of Kimberley, the founder of the Hardy-Hanson Brewery. He lived there until his death in 1897. In 1908, Alderman Albert Ball, father of the famous First World War flying ace, Albert Ball V.C., purchased Bulwell Hall and 575 acres with min­eral rights. He later sold 225 acres to Nottingham Corporation, which became the Bulwell Hall Housing Estate. The Hall and the rest of the Estate became a Public Park. This page was added by H W on 08/10/2013.